Occupational Therapy or OT helps individuals who are affected with cerebral palsy to actively engage in daily work activities which hold meaning for them. There is a family centered philosophy that is used in conjunction with children who are suffering from Cerebral Palsy. Most occupational therapists work closely in partnership with affected families so that their priorities and concerns are addressed. Some occupational therapists can address problems which are connected to sensory, motor and cognitive impediments that result from Cerebral Palsy and this affects the participation ability in the daily activities. The therapist who is treating the patient may ask for certain changes to be incorporated in the play space, changing the structure of the building and seating techniques which allows the child to go on an improved curve of learning and healing. 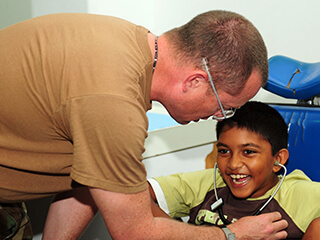 The OT or Occupational Therapy is an important part of cerebral palsy holistic treatment. The ability of the patient to carry on routine tasks and basic activities in a structured way. Occupational therapy focuses on the adaptation, compensation and achievement of all function levels. There are a number of physical functioning abilities and cognitive abilities, latent emotional needs and ability to adapt to situations factors which needs to be considered by the expert occupational therapist before an occupational therapy program is structured and the therapeutic interventions. Children who have CP have reduced sensory perceptions and a stunted perception of the visual power of the brain. To conquer this the occupational therapist may plan and look for implementation of SPM or sensory perceptual motor training for kids who have CP so that they become competent of producing organised behaviour pattern. Functional and daily abilities of people with CP are vastly enhanced with SPM training treatment and management. People with cerebral palsy have increased chances of contracting pressure sores on various parts of the body. The bones in the body may also crack under pressure and the patient may become confined to the wheelchair. The therapist can educate the child, caregiver and the concerned family members about the prevention of pressure sores and checking out the skin for potential irrelative areas and the importance of changing positions in a scientific way. The visual and motor impairments are particularly prominent in children with CP and this is why children who are suffering from this disease have problems in comprehending the organisation and order of some tasks which are basically required for self care. An occupational therapist can also help sketch a morning routine with a proper schedule and reminders and therapeutic interventions. The steps involved in the performance of the tasks will be broken down into small tasks which will be manageable. In case the child or adult is not able to function normally then the occupational therapists will help addressing motor impairments in several ways. Progressive training can increase the resistance and strength of muscles and this is very important in the context of a Cerebral Palsy patient.